Some developers of luxury condo and rental buildings are giving all their residents a piece of the top floor—creating a shared space for amenities, instead of anindividual penthouse unit. For residents, the cost is folded into annual fees. The developers hope that offering perks typically associated with a penthouse will allow them to charge more for smaller units throughout their buildings. Shared top-floor spaces in new buildings can include private dining rooms, libraries, pools and screening rooms. In New York, JDS Development is developing 626 First Avenue, which will feature amenities such as a rooftop pool, bar and cabanas atop one of its two towers. “All residents, whether they live on the lowest floor or the highest, should be able to enjoy the commanding views,” says JDS Development’s Michael Stern. When designing the infinity swimming pool on the top floor of One Thousand Museum, Pritzker Prize-winning architect Zaha Hadid added reflective metallic panels that resemble giant water drops on the arched ceiling over the pool. 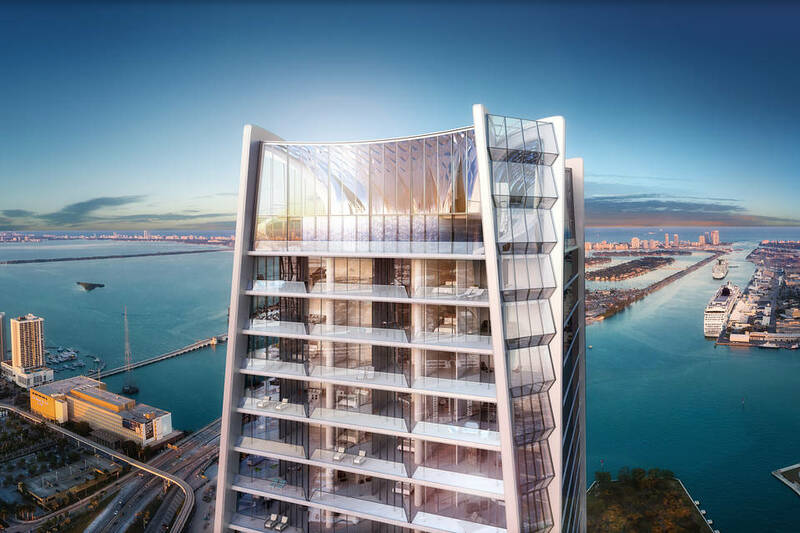 She wanted the light to bounce back and forth, so that to viewers from afar, the slender 66-story building would resemble a lighthouse rising out of Biscayne Bay. 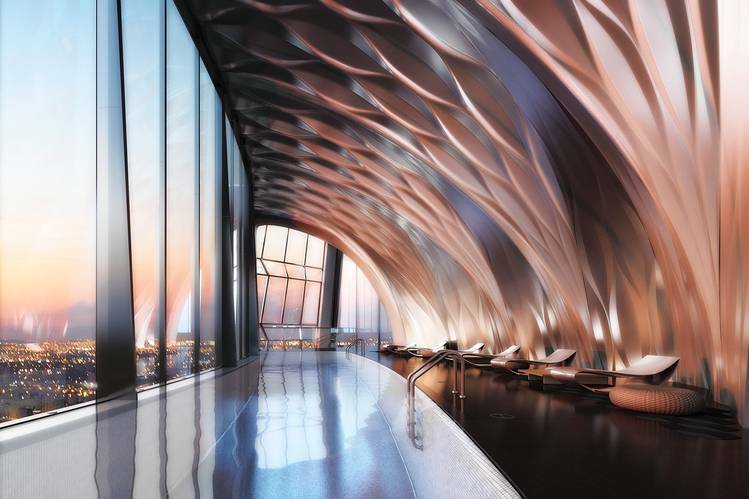 The “public penthouse space,” as developer Louis Birdman calls it, will feature a sunbathing terrace, a bar called the Sky Lounge, a private dining room and theater. The roof will have a helipad. One Thousand Museum is set to be completed in 2017 and will have 83 units priced from $5.7 million to $49 million. 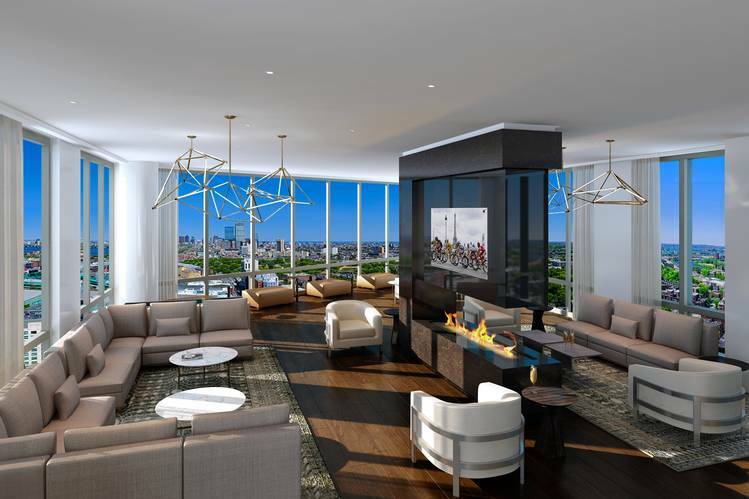 Developers Samuels & Associates are planning a common area on the top floor to provide all residents with 360-degree views of Cambridge, the Charles River and the Emerald Necklace set of parks. The floor also will include an outdoor pool, a roof deck and private “sky cabanas” that residents can purchase for a price to be determined. A water motif continues indoors with a custom-made floor, designed by CBT Architects, in the private dining room. The glass floor will be suspended two inches above a blue glass tile mosaic that suggests water when illuminated. A lounge on the same floor will have fireplaces, a TV and a seating area. The 30-story Pierce is to be completed in 2018 and will have 240 apartments and 109 condos, from about $1 million to more than $4 million. Residents of the Seychelle Santa Monica, a new 10-story luxury condo in California, are able to swim in the rooftop pool and enjoy the view of the Pacific Ocean a block away. Additional poolside amenities include a Jacuzzi, furnished cabanas and open-air barbecues, as well as a chef’s kitchen and fireplace. The developers used Clodagh Design to make the rooftop gathering space “tranquil like a spa,” said Gino Canori of the Related Companies. The developer has previous experience creating top-floor common areas: The Related Companies developed 1 MiMA Tower in midtown Manhattan with a top-floor lounge known as the Jewel Box. The Seychelle Santa Monica was completed in 2014 and has 93 condos ranging from $1.525 million to $10 million. The developers of 626 First Avenue, two new residential towers clad in copper and standing 40 and 49 stories-high, decided to put all the mechanics on top of the west building to free up the top of the east building for amenities. Now the top of the east tower contains a pool, bar, cabanas and grills for residents. The two towers, said to be “dancing” because they bend in the middle like two people dipping, will be connected by a sky bridge that will contain an indoor lap-swimming pool “that will float between the towers” says Michael Stern of JDS Development. There will also be a Turkish bath, whirlpool and spa treatment rooms in the sky bridge. To be completed in 2017, 626 First Avenue will contain 800 rental units starting at $2,800 for a studio apartment.